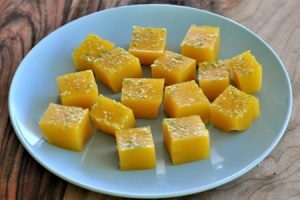 Creating healthy, easy AND delicious gluten free food for kids can be quite daunting at first, but it doesn’t have to be. With the growing number of kids being diagnosed with celiac disease or gluten intolerance, the demand for gluten free meals and recipes has exploded. I know that the media often claim that putting your child on a gluten free diet puts them at risk of nutrient deficiency, or that it may even be unsafe for your child. As a parent you want the best for your children and care for their growing bodies and developing brains. So do you really need to worry about a gluten free diet being less nutritious? Well that depends on how you implement a gluten free diet in your home and what foods you choose to substitute with. Will you choose nourishing, whole, fresh foods from nature or use packaged pre-purchased gluten free alternatives? When people find out that their kids can no longer eat gluten, they can easily fall into the ‘gluten free food trap’. If you want to avoid this, then read my blog ‘The Gluten Free Trap: how to avoid processed food’ for more information and tips. I know a lot of people believe that gluten-free diets are the latest fad diet. However many of us are beginning to find out that we feel much better not eating gluten, that our kids behave better, sleep better and are overall healthier. The symptoms such as ‘foggy brain’ that we thought we had to live with forever, begin to vanish. When you begin eating nutrient dense, gluten free food ‘made from scratch’ the flavours and textures are so superior you’ll wish you switched much earlier. The best part, your kids won’t even know that a lot of your new creations are gluten free! 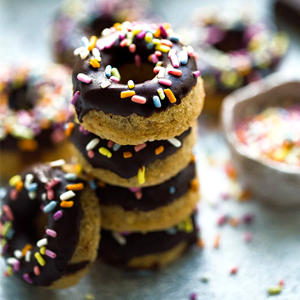 Paleo Donuts! These are made from simple, real food ingredients including; cashews, eggs, arrowroot flour and ghee! 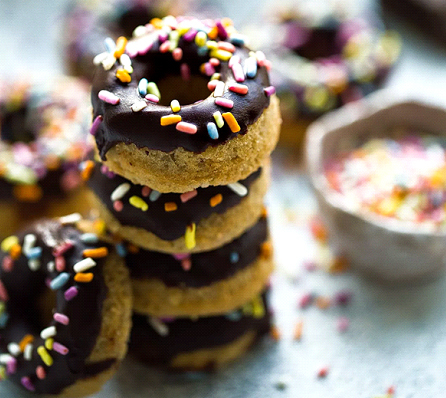 These mini donuts are topped with junk-free naturally coloured sprinkles, but you could also sprinkle shredded coconut, chopped cacao melts or cinnamon on top for different flavours and textures. I can only imagine if you make these your kids will find it hard to stop at just one. These would make a delicious school lunch box or afternoon treat. All the ingredients are nourishing, real foods so you don’t have to feel guilty about your kids eating it. They’re also gluten free, grain free, paleo, refined sugar free and egg free. They’re a big hit with everyone. 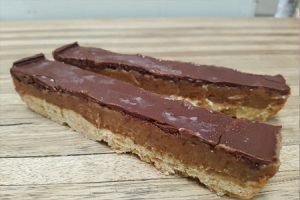 This recipe is a simple, quick and easy healthy take on the usual processed and sugar laden muesli bars typically found in supermarkets. This little bar is made up of 100% real foods and is sure to be a winner with the kids. These apple chips seem like they would be the perfect road trip, movie snack or simply just a grab and go snack, especially for school kids. 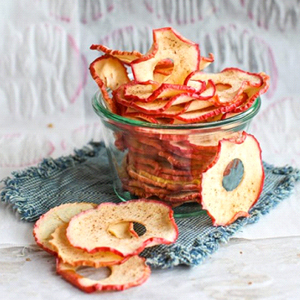 You can bake the apple chips until they are crispy, or leave them slightly chewy depending on your kids preference. This is such a clever idea. 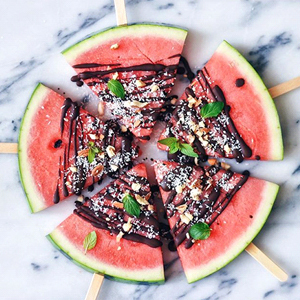 A refreshing take on the usual ‘ice-block’, this would be perfect to eat on a hot summer’s day. I remember being a kid and trying to eat those almost gigantic popsicles, they were awkward to eat, melted way to fast and you always ended up feeling sticky. 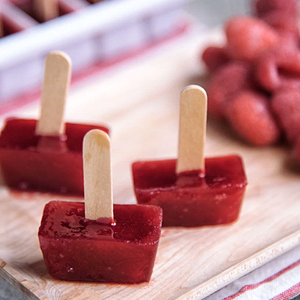 Here’s a better idea, why not make them into bite sized popsicles. These mini treats are perfectly sized for little hands and mouths and they’re 100% made from fruit with no added sugars. Store bought jelly can have some pretty nasty ingredients in them. It’s so easy to make jelly at home yourself and you may be surprised to learn just how many health benefits it has. Jelly (or the gelatin found in jelly) contains natural amino acids and collagen, which is good for the skin, hair, teeth and nail health. It’s also great for joints and joint recovery, can aid in digestion, boost moods, aids in the livers natural detoxification and so much more. 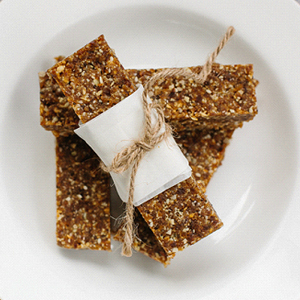 These are such a great, healthy gut healing snack for kids.